Yangeob is a school realizing God’s love under the educational philosophy of Father Choi Yang-eob, who was an educator of hope who waited for students, educator of respect who preached the truth from the people’s perspective, and educator of love who maintained a gentle heart. 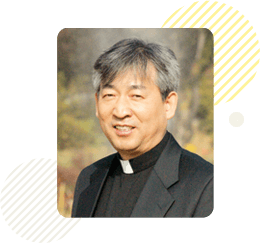 Taking the name of Father Choi Yang-eob, whose name means “good work,” Yangeob education represents the ceaseless effort to complete love. Education that make people to be like people is enabled only through love. “The weight and depth of a man's soul is heavier and deeper than the ocean and the universe.” Yangeob educators know the value of individual young souls attending their school. The laughter of our students and their vibrant movements are the heavenly sound from the oceans and the universe, indeed the music of God. Any one of our student should not be outside of our love and care. Building a model of education in Korea and the world, Yangeob high school seeks to me the light and salt that provides a new vision. Yangeob will be a place for teachers providing education, students living in the school, and parents caring for the students to come together to make a happy school and realize high-quality education. In this process, our school will become a place of hope where students want to attend, learn, and stay. Through the intersession of our school’s patron saint Father Choi Yang-eob, I hope that all members of Yangeob community will be happy in the blessing and love of our Lord.